We’ve been watching the branding initiatives at Newfields unfold over the last year along with exciting new programs. Inspired the changes taking place and particularly their transparency about”why” they were making them, we asked the museum’s staff to share their story with the broader AMM membership. Enjoy this post by guest contributor Gary Stoppelman, Deputy Director for Marketing & External Affairs at Newfields. In 2012 the internationally renowned Indianapolis Museum of Art was thriving by many measures. At 600,000 square feet it is bigger than MoMA. Highlights of its collection of more than 50,000 works of art include one of the earliest known self-portraits by Rembrandt. The collection offers an unparalleled view of the beginning of modern painting through the finest collection outside Europe of paintings by Georges Seurat and his Neo-Impressionist followers and the largest U.S. collection of works by Paul Gaugin and the Pont Aven school. The IMA is home to one of the world’s leading collections of Japanese painting. The galleries are surrounded by the most beautifully curated Garden in Indiana. Three historic homes—including Aero Saarinen and Alexander Girard’s masterpiece, the Miller House and Garden—add context to the history of life of central Indiana. The organization was also over $100 million in debt, spending at an annual rate of 7% of its endowment, funding over 70% of its operating budget from the endowment and facing 30 years of static attendance. In other words, if the Museum continued its course, it would have to close its doors in a generation. The first experiment was to host blockbuster exhibitions like Matisse and Georgia O’Keefe. These exhibitions drew a greater share of the population than the same exhibitions in other markets. However, the size of the Indianapolis market meant that the IMA could not draw the same total as museums in larger markets. We ended up losing money while engaging more guests. Expensive blockbuster exhibitions would not yield a path to long term sustainability. Halverson catalogued over 50 million annual leisure activities in our market. We weren’t surprised that we captured less than 1%. We weren’t surprised that the Children’s Museum captured twice what we did. What did surprise us was that over 50% of that activity included programs we already offered: outdoor recreation, movies, lectures and classes, and dining and drinking. This gave us hope. We could invite our community to extraordinary outdoor experiences. And we had just hired a gold level sommelier to enhance our food and beverage program. What would it take to increase our share? 94% of the market had heard of the IMA. Over half of the community had been to the IMA at some point (that might’ve been in fourth grade). Awareness and trial weren’t translating into visitation. A very small portion of the community, only 16%, made up 93% of our business. Like most art museums, we had a small, passionate group of highly engaged supporters. Said another way, we weren’t living up to our mission because 84% of the community was not engaged. The study identified a very large segment, 57% of the community, as potential visitors (called the moveable middle). Demographically and behaviorally, the moveable middle isn’t different from our core group of active users. There was just some barrier keeping them from visiting. We turned our quantitative research over to Young and Laramore a national branding agency based in Indianapolis to conduct an exhaustive (and exhausting) qualitative study. Unlike traditional qualitative studies which are often done in focus groups, Y & L went into the living rooms of the moveable middle and recorded hours of painful video testimony about perceptions of the IMA. The study revealed that the moveable middle didn’t come to us for outdoor events because they thought of us exclusively as an indoor place. The next barrier revealed was that the “experience never changed,” meaning “paintings hanging on a white wall.” The very words “art” and “museum” were a barrier to engaging this audience in programs outside the galleries. One woman shared that she wouldn’t invite her friends to the IMA unless there was an exhibition of a familiar artist. She did bring her friends to the artist open studio events downtown because her friends “could have a drink and be social” there. The moveable middle was not seeking new adventures. They would try something new only when it was rooted in something familiar, like food, music, or shared interests. 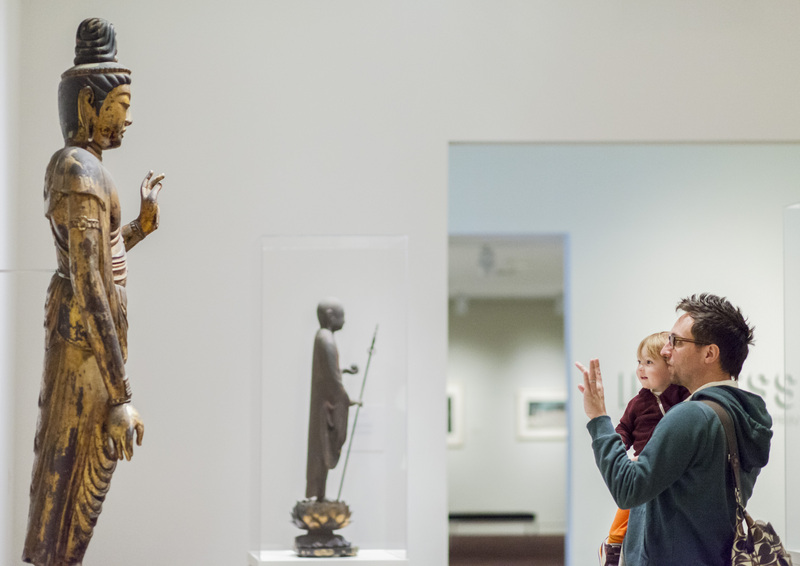 Museum patrons view Momoyama-period Japanese attendant bodhisattva (about 1575). Gift of Mr. and Mrs. Sidney D. Eskenazi, Gift of Mr. and Mrs. Irwin Katz, 75.771. So the challenge became how to balance the familiar with curated expertise when engaging the moveable middle. The answer, we came to understand, was that we do this every day. Only at the IMA can you see the most beautifully curated gardens in all of Indiana. In every town in the state there’s a summer car show. Only at the IMA will you find Dreamcars. “Imagine,” we wondered, “if we brought our curatorial expertise to a holiday lights experience on par with the best botanical gardens in the country.” Our expertise distinguishes us when we invite our public to more familiar experiences. We conducted an experiment in the spring of 2017. We showcased over 250,000 spring blooms in The Garden alongside an intelligently curated exhibition of the watercolors of John James Audubon in the Museum. We added two exhibitions of contemporary artists exploring themes found in the Audubon exhibition alongside bird cams and nature walks in our Virginia B. Fairbanks Art and Nature Park. Then we inaugurated a beautiful and beautifully simple Beer Garden. The results? Attendance increased 72% over the prior spring. 38% of guests were from the moveable middle. The age and ethnicity of our guests was younger and more diverse than ever before. This data from our research and experiments emboldened the Trustees to name the campus for the first time. The name Newfields is rooted in our history and guides our aspirations for the future. 50 years ago, Ruth Lilly and Josiah K. Lilly III donated their parents’ estate, Oldfields, to what was then known as the Art Association of Indianapolis. That selflessly generous gift, which included Newfield, the home they both lived in as young adults was a pivotal moment in our community’s history and a catalyst that forever changed the trajectory of this organization. I should be clear. The name of the Museum remains the Indianapolis Museum of Art. We now invite you to the IMA at Newfields. Think of it like a college campus. Inspired by the past, the name Newfields is also a commitment to the future: To be a place, forever moving forward, where our community can explore new fields of study, new fields of inquiry and new experiences. In that spirit that we launched this new campus name with an entirely new reason to visit—which we hoped would become a new tradition. In November 2017, the community was invited to see their family’s faces lit by the glow of a million holiday lights in a magical nighttime garden display called Winterlights. The results? We transformed our lowest attended season into our highest. Nearly 70,000 guests visited the first year, exceeding expectations by 100%. Revenue exceeded projections by 200%. Over 800 volunteers donated over 4100 hours of time. Satisfaction scores were off the charts. NBC news named Winterlights one of the top thirty light shows in the world. Over 45 couples that we know of chose Winterlights at Newfields as the site of one of the most important moments in their lives, their wedding engagement. To me, that says we just may be onto something. ← Supporting Vibrant Neighborhoods: How Do Museums Address Displacement?